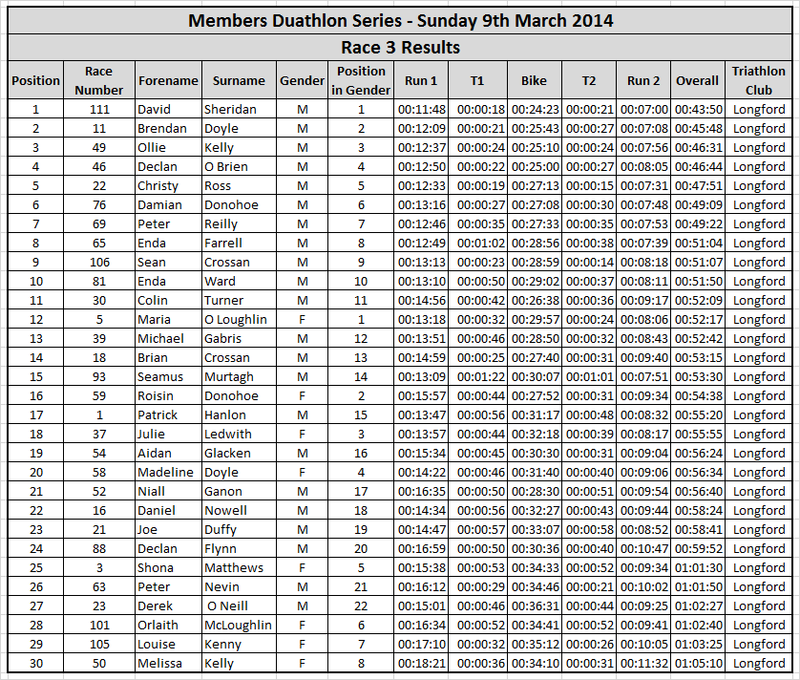 Race three happened today with our biggest turnout so far of 30 competitors under near perfect racing conditions. This led to a very fast race under the watchful eyes of lead marshals Niall Nolan, Aidan Brady and their team. There was no wind and while the ground was wet, the rain held off for the duration of the race. The race was won by David Sheridan in a comfortable time of 43:50 which was ahead of David's nearest rival by 1 minute 58 seconds. David's time also makes him the new course record holder knocking an impressive 1 min and 28 seconds off the previous course record held by Donal Mulligans (2013 Race 2 time of 45:18). Race one and race two winner Roisin Donohoe did well again today improving on Roisin's last weeks time, but it wasn't enough to hold off Maria O Loughlin. Maria who has always been in the top three since the start of this year's duathlons did very well today and took the ladies first place slot in a time of 52:17. In doing so Maria now holds the course record raising the bar by an impressive 2 min and 1 seconds on today's second place winner Roisin Donohoe previous course record (2014 Race 1 time of 54:18).